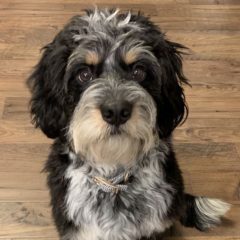 At South Mountain Doodles all of our breeding dogs have been carefully selected and chosen specifically based upon important attributes and traits that we feel strengthen the doodle genetic gene pool. Temperament and consistency in coat type are the main goals within our breeding program. It is our mission to bring to you a family friendly companion dog with an allergy-friendly coat. With every breeding that takes place at South Mountain you can be assured that every positive aspect of the breed has been taken into account and that the combination we have chosen represents the goals and high standards that we have in place for our breeding program. The Ghost of Dolley Madison is one of the most famous and frequently seen ghosts people have claimed to see in the Washington DC area, most often around the White House Rose Garden. Our girl Dolley is named respectively after the wife of President James Madison. Dolley is a sweet girl who is a total joy to everyone who comes into contact with her. Love and joy just exude from her…..she overflows with happiness! We are over the moon for our girl Gordita! 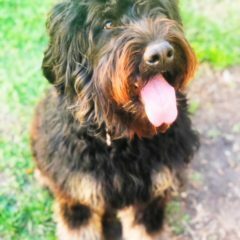 She is fun, lovable and genuinely a true picture of what a Bernedoodles should be! She is a classic medium sized F1 and we will have fantastic mini lines with her. We are excited for 2019 and cannot wait to see her babies! Harley is our mini phantom girl. She has a big personality in a small package! She weighs about 25 pounds. 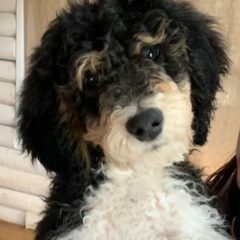 Harley will have tris and phantom puppies for us in 2019. We can hardly wait to see her beautiful babies! She resides in Arizona. Our little Bou is named after Jacqueline Kennedy Onassis. Her maiden name was Bouvier and we thought this little girl would be an adorable little Bou. She is the sweetest little gal you ever did meet! She loves meeting and greeting everyone! 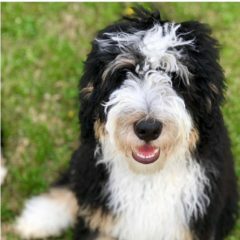 She is a mini and will head up our mini Bernedoodle program. We will see royal offspring in 2019! 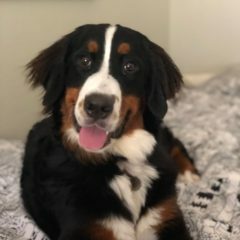 Sadie is a gorgeous Bernese Mountain Dog and she has the sweetest disposition! She is one of our foundation girls at SMB and will bring her nice solid genes into our breeding lines! We love her conformation and gorgeous smile! She is exceptional! 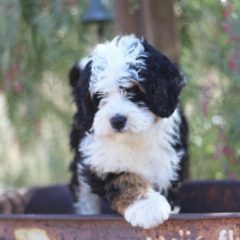 Named after President Jimmy Carter and his 1976 campaign slogan, our fluff ball Finn is a mini F1 bernedoodle destined for big things! He is playful, funny, friendly and loves everyone. He has a beautiful soft fleece coat that is plush and perfect. He is one of our foundation studs here at SMD and we just could not be happier with his sweet disposition and and lovable antics! Named after First Lady Elenor Roosevelt and her favorite hymn “Brighten the Corners Where you Are”, our Ellie is destined for big things here at SMB! 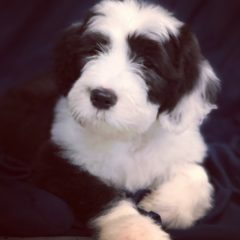 Ellie is a phantom colored standard F1 Bernedoodle. 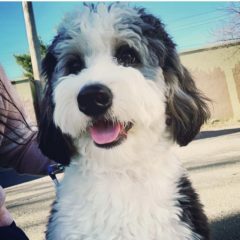 She is super sweet, loves everyone and knows a gazoodle of tricks! She loves to entertain and anyone getting one of her pups will be in love! She lives in her guardian family in the Phoenix, Arizona area. She certainly brightens any room she enters! Named after President Ronald Reagan’s obsession with having blueberry jelly beans on the Oval Office desk. The blueberry Jelly Belly was actually created for his 1981 Inauguration. He began eating jelly beans to overcome and quit smoking when he ran for governor of California. It worked and he was hooked after that! Jelly Beans is a full sister to our Carter and Kennedy. 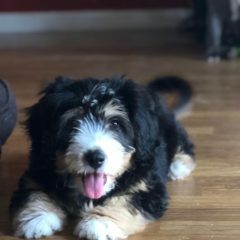 She is a mini Bernedoodle and she has personality plus! We cannot wait to see what this girl does for our program, but for now she is just enjoying puppyhood! Queen is our Ukrainian import girl and we are obsessed with her! Sweet, silly, and uber lovable! 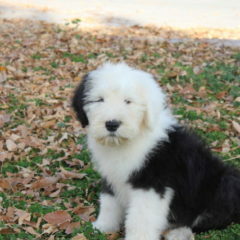 She is our founding Old English Sheepdog who will start our Sheepadoodle program. She has perfect gait and conformation and has a temperament that is stellar! 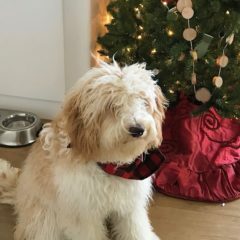 Lani is one of our Bernedoodle girls and a precious one she is! 25 pounds of pure sweetness and personality plus! This girl will keep you laughing. A beautiful coat, structure and temperament she is a perfect 10! Named after the nations 6th president John Quincy Adams, we also named this girl after his favorite hobby which so happened to be skinny-dipping! And this little rambunctious girl has a spunky side too. We love her sweet personality and adorable antics! We can’t wait to see what this girl brings into our program in 2019! Quincy lives with her guardian family in the Elk Grove, CA area. The last Democratic-Republican president of the United States and the last of the Virginia Dynasty (first 5 presidents were all Virginians), we named this little sweety after President James Monroe. Monroe is a full sister to our Quincy. She is spunky, lovable and loves to be adored and loved on! We are thrilled to have her in our program! 2019 is looking bright! Named after President Franklin D. Roosevelt and his 1932 campaign slogan, our Frankie Love is the foundation female here at SMB! 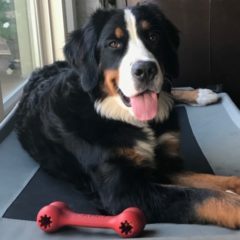 Frankie is a full blooded Bernese Mountain Dog. She has stolen our hearts and our home! We love and cherish her phenomenal temperament and silly antics. We are pleased to have her and bring this stellar and sound temperament into our breeding program. 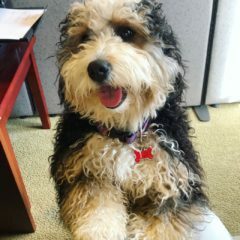 We are super pleased to announce the arrival of Kennedy into our Bernedoodle program! 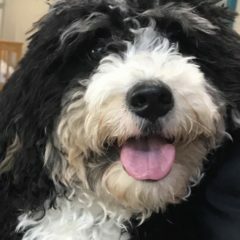 Named after JFK and his awesome campaign slogan, Kennedy is an F1 mini Bernadoodle who will be raised by one of our fabulous guardians in California. She will be living with one of our SBL mommas Reagan and will be health tested when she is older – if everything goes as planned we will see her pups debut in 2019-2020. 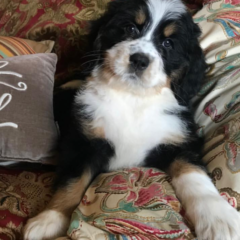 Kennedy is a tri-colored bernedoodle with an amazing plush coat! 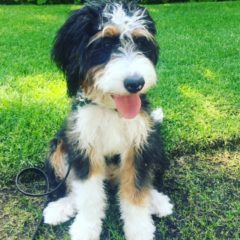 Named after the former First Lady’s love for growing lillies in the White House garden – Lily is our little sweet apricot and white mini Australian Bernedoodle! She carries tri, parti and phantom and will bring us some fantastic puppies when she is older! Named after the Benjamin Harrison and Grover Cleveland controversial election where Cleveland won the popular vote and Harrison took the election via the electoral college vote. Our little Tallie is a big hunk of love in a small package! Full sister to our Lucy, this little gal will do big things her at SMB! Our new addition is named after President Rutherford B. Hayes wife Lucy Hayes, we loved the nickname of the former FLOTUS Lemonade Lucy. She apparently was part of the temperance movement and banned the consumption of alcohol within the White House. Hence earning the name Lemonade Lucy! 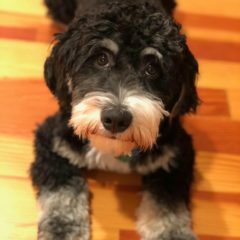 Our Lucy is a mini Bernedoodle who will be in the 25 pound range at maturity! She lives with her guardian family in Jackson, CA. Named after the adorable pet name President George Herbert Walker Bush gave to his beloved Barbara, this little “silver fox” is no exception when it comes to being adorable! 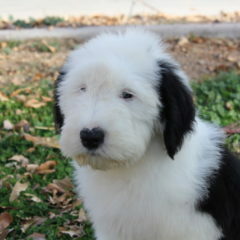 A mini F1 bernedoodle, this girls remarkable Blue Merle coat with tri markings is a show stopper! We cannot wait to see what she does for us in 2019! 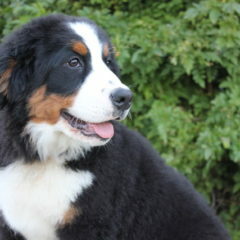 Trixie is one of our BMD foundation girls. Super sweet, ultra stocky and with a personality plus…it would be an understatement to say we are in love with this adorable girl. 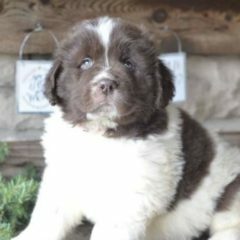 For now she will just enjoy her puppyhood but she will make her debut in 2020 as a SMD momma! Posey is just a gem of a pup! 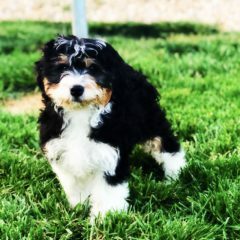 She joins our mini Bernedoodle line up and we are so excited to have her. 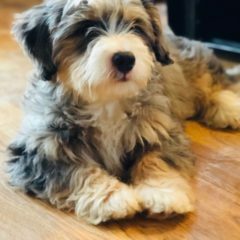 She lives with her guardian family who have 2 other of our fabulous pooches and she is living her puppyhood to the fullest! 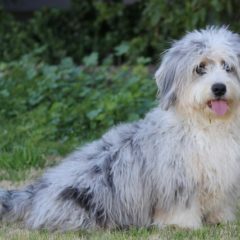 She is one of our blue merle girls added to our program. Such an adorable little mini with an amazingly sweet personality. This year Nova will live her best life as a puppy hanging out with her guardian family in the Yuba Sutter area. Lady is one of the adorable girls we kept back from our Australian Bernedoodle litter from Sadie and Herc. We are very proud of this litter and can’t wait to see what Lady will bring to our program in 2020. She is a gorgeous tri girl and just as sweet as can be! Lady lives with her awesome guardian family in Vacaville, CA. Georgia is one of the adorable girls we kept back from our Australian Bernedoodle litter from Sadie and Herc. We are very proud of this litter and can’t wait to see what Georgia will bring to our program in 2020. She is a gorgeous tri girl and just as sweet as can be! She lives with her awesome guardian family in Roseville, CA. 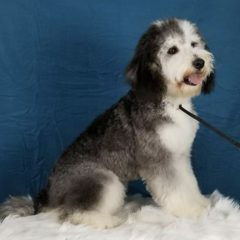 Ivy is one of our gorgeous Old English Sheepdogs that we have brought into our doodle program for the 2019 year. We are enamored with the gentle nature of this breed. 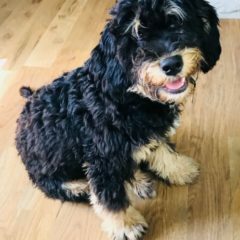 Watchful yet playful, calm and relaxed, no prey drive, joyful and silly, lover of everyone – we knew this would be another winning combo when crossed to our fantastic poodle lines. For now, Ivy will enjoy her puppyhood with sister Stella in the Phoenix area. Stella is full sister to our Ivy. 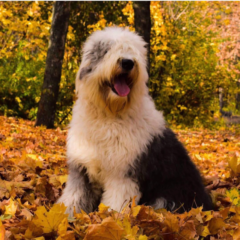 Old English Sheepdogs are a breed we thought long and hard about introducing into our lines for Sheepadoodles. We love all of the attributes of this breed: Gentle, playful, watchful, silly, no prey drive, calm, obedient….you would be hard pressed to find a negative trait about this breed. We are so excited to watch this line develop here at South Mountain. Stella lives with her sister Ivy in the Phoenix area. 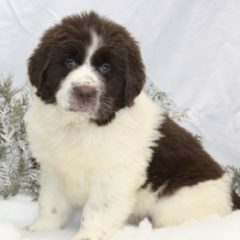 Kate is one of our new Newfoundland pups being raised in her guardian home in the Phoenix, Arizona region! 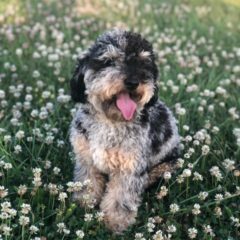 She will be one of our founding girls for our 2020 Newfypoo litters! We are so excited about this upcoming venture! Bailey is one of our new Newfoundland pups being raised in her guardian home in the Phoenix, Arizona region! 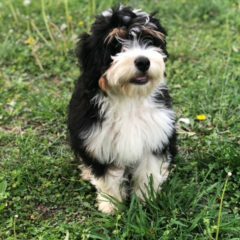 She will be one of our founding girls for our 2020 Newfypoo litters! We are so excited about this upcoming venture! Jefferson is our handsome little stud muffin. 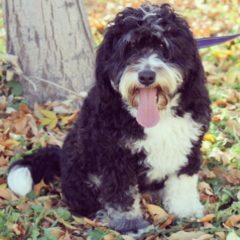 He is a mini poodle who will be used within both our Bernedoodle & Labradoodle program. He is a tri-blue Merle like his infamous daughter Blu who everyone is in LOVE with! What we love is that he is very smart, loves everyone and is extremely calm! He is the perfect blended balance and will add a great new touch to our program…and the blue…he will add that show-stopping blue coloration! Already a proven stud, he will begin immediately here at SMB & SBL – He lives with our family. 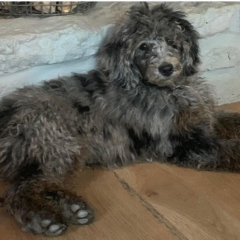 Georgie is one of our sweet little Mini Poodle sires that will be used within both our Bernedoodle and Labradoodle programs. He is a parti tri boy! He has the sweetest disposition! Very blessed to have him in our program! Bowie is our rock star Standard Poodle Phantom Tri! 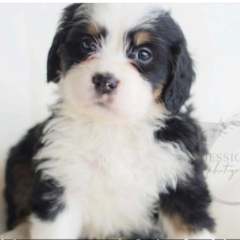 He is perfect in every way and will sire our Standard Bernedoodles litters here at SMD! Super sweet and the best temperament and he’s super gorgeous to boot! The perfect boy for our program….his groupies will be swooning! 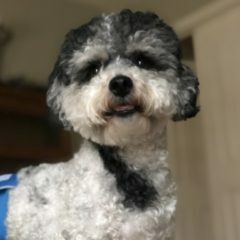 Bronx is our moyen poodle boy who is going to bring some gorgeous pups into both of our programs. Mature weight at 25 pounds he will bring a solid build and some outstanding color to our litters! Yep….we are excited for 2019 and you should be too! Porter is sheer perfection! 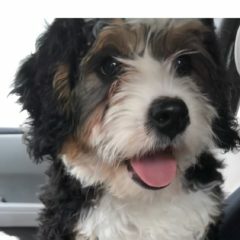 He is a mini Australian Aussiedoodle. 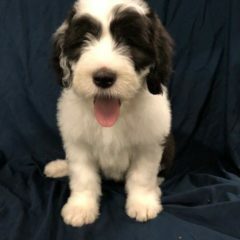 We brought him into our program to bring his nice tri-color genetics, sweet disposition and silky smooth coat into both of our Bernedoodle and Labradoodle programs! 2019 will be a great year and we cannot wait to see the puppies Porter will sire!